What is it that we actually look at when we go wave watching? 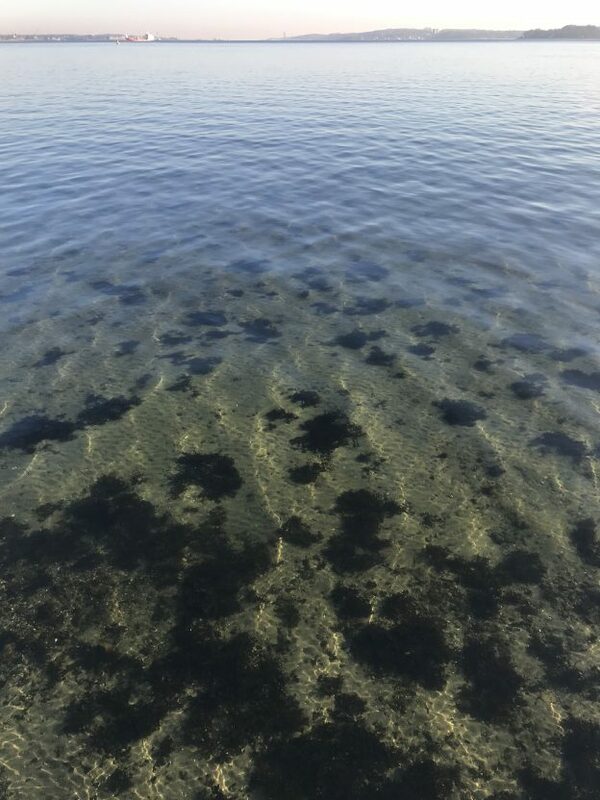 Water is pretty much clear (or at least it is in the spots where I like to go wave watching), so how come we are able to see waves? What we are looking at are not actually the waves themselves, but at how surfaces oriented in different directions reflect light from different directions towards us, and usually the light isn’t uniformly distributed, so we see lighter and darker areas on the waves that are associated with certain orientations of the surface, i.e. the slopes going up and down to and from the crests. But this only happens if we look at water at a small angle — then the water surface acts to reflect most of the light from above. 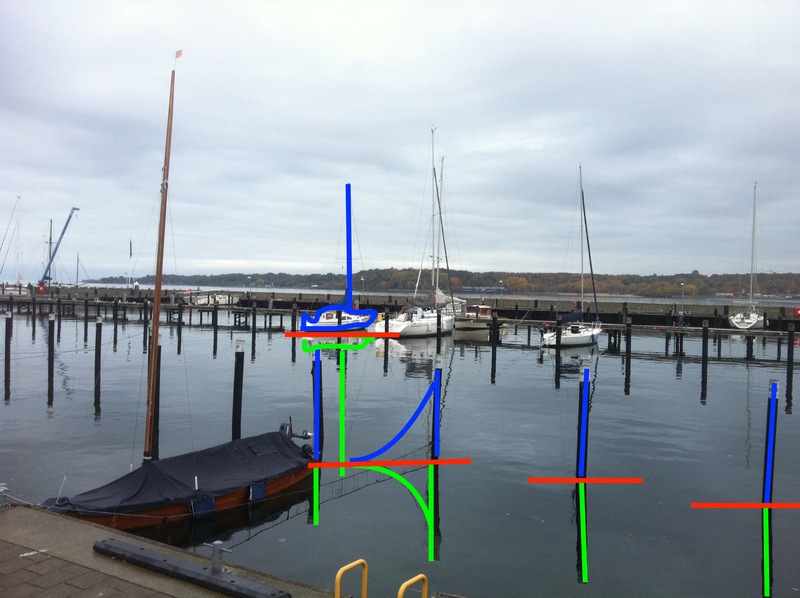 However if we look at water at a steep angle, we are actually able to look inside. See this in the picture above? 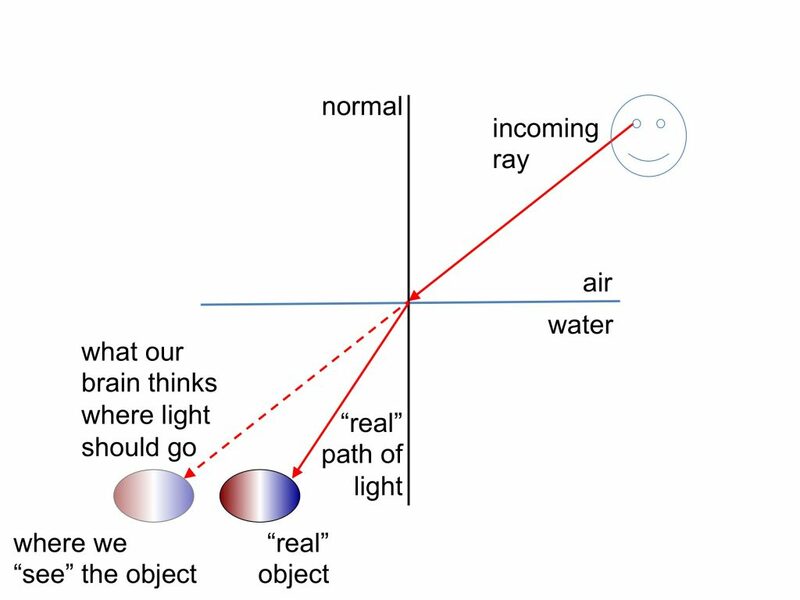 This is due to a phenomenon called total internal reflection. 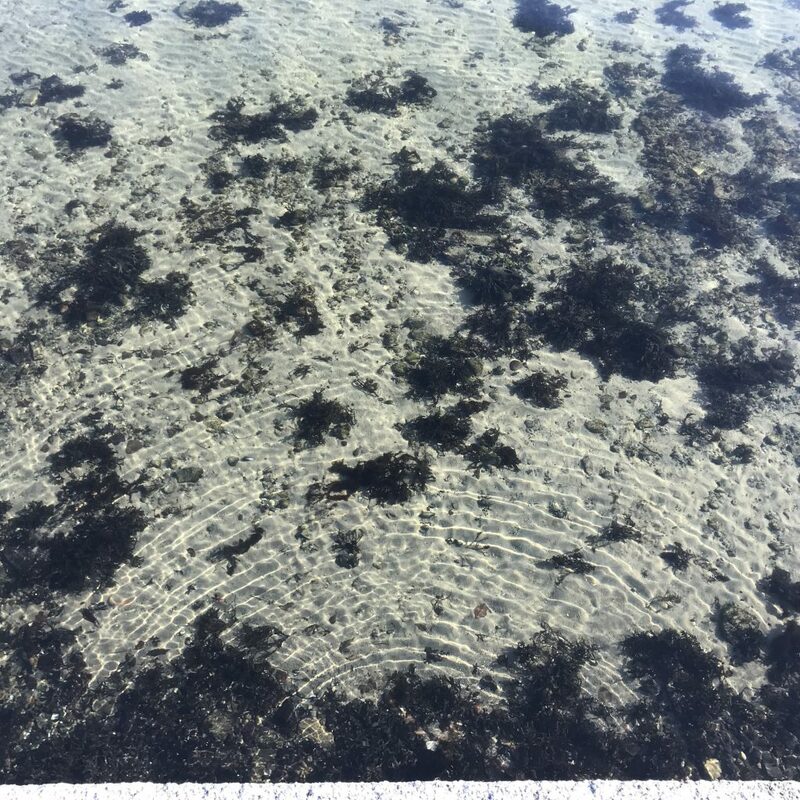 Now that light easily gets in and out of the water, the water surface does something weird: It acts as a lens and focusses light on the sea floor so we see bright areas and not so bright areas. And looking at how the brightness is distributed on the sea floor, we can figure out what the waves must be to have focussed the light in exactly that way, even though we can’t see the water surface. Let’s start with an easy example. Below, you see the half circles of concentric waves radiating away from some obstacle at the bottom of the sea wall. The further away from the center you look, the more other waves you notice as the concentric circles become more and more difficult to see. Moving on to a slightly more difficult case below. You see the waves radiating away from the seagulls. Behind them, at a shallow angle, you mainly see the ambient light of the sky reflected on the waters surface to let you see the waves. 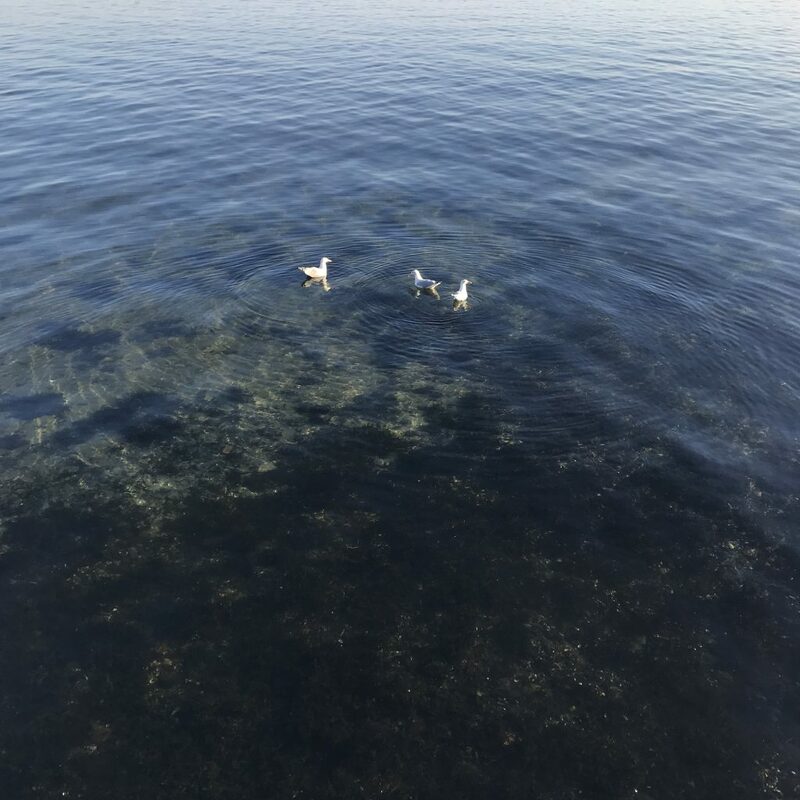 Towards us, though, at a steeper angle, it gets more and more difficult to see the water surface and the waves, but we start seeing the light focussed on the sea floor, mirroring the circles of the waves above. 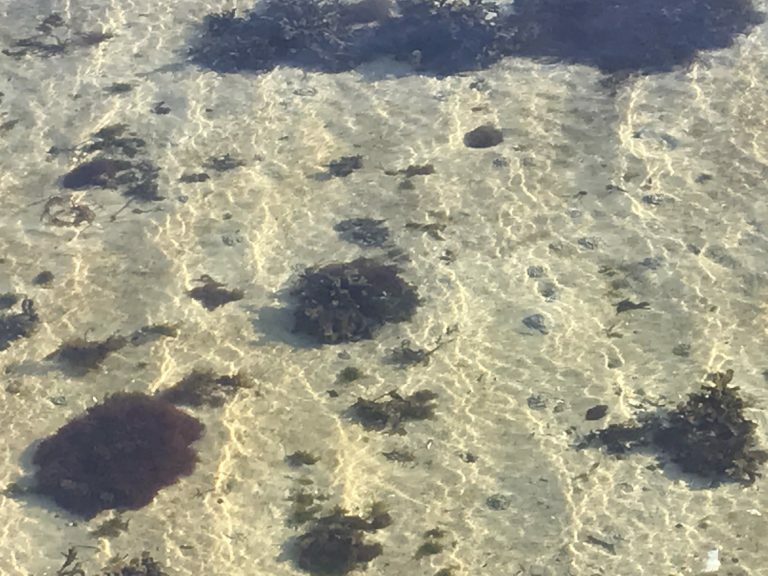 Here is another example of waves , except this time we see because of reflection of light on the surface further out, vs focussing of light on the sea floor closer to us, except that this time we are not looking at the same waves any more. The waves further out are wind waves and waves the birds made, the waves further in are similar to the ones in the second picture — created by an obstacle at the base of the sea wall. But then sometimes it gets really difficult to reconcile the waves we see through these two different phenomena. 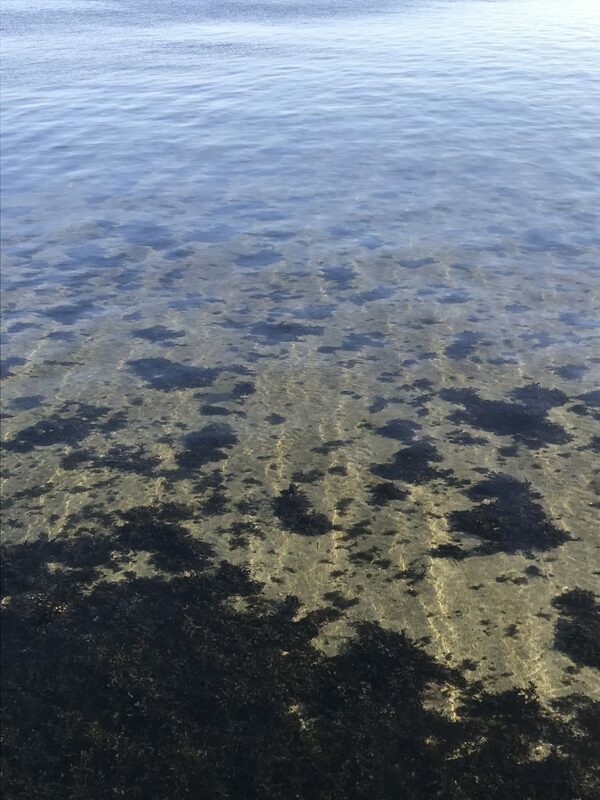 Below, the wave field we see by looking at the light reflected at the surface seems to be dominated by wave crests coming towards us, with the crests being more or less parallel to the sea wall at the bottom of the picture. 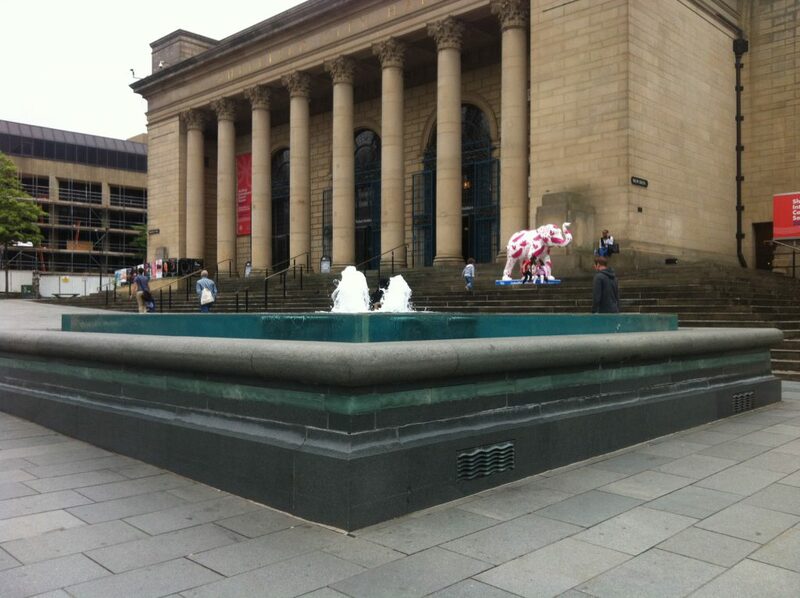 There is some small stuff going on on top of that, but it doesn’t seem very important. 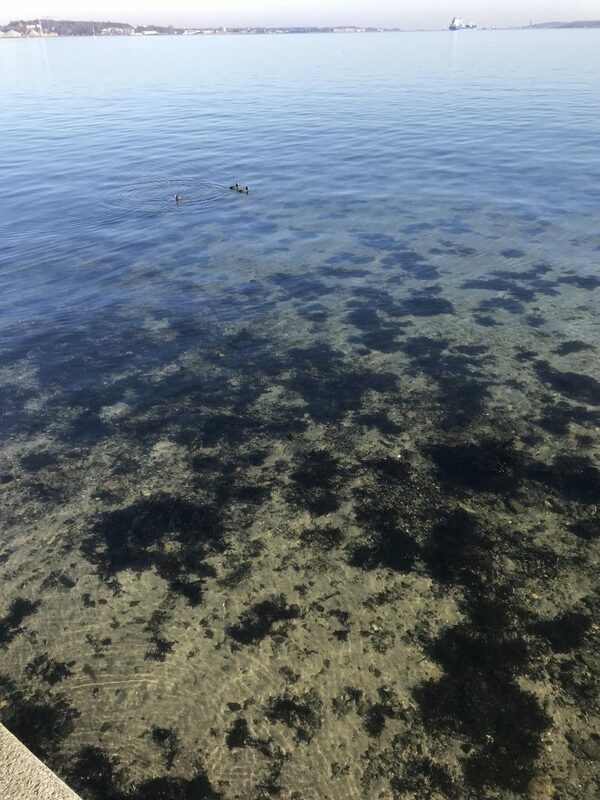 But now looking at the pattern of light on the sea floor, we pick out something very different: The dominant wave crests are now perpendicular to the sea wall when you look at the middle of the picture below (towards the bottom we see those half circles again that we saw above, too)! Where do those wave crests come from that are perpendicular to the sea wall? There are actually two things I can think of. First: they are actually an important part of the wave field, we just don’t pick them up very well because — in contrast to the waves coming towards us with the side going up towards the crest reflecting the dark land behind us and the side going down towards the trough reflecting the bright sky — waves going perpendicularly to that field would mainly reflect the sky, so it would be hard to make out their crests and troughs since they appear to be the same color. Second: I’m not actually sure this makes sense any more. I was going to say that the surface shape of wave crests moving away from the sun might be more suited to focus light than wave crests moving in a perpendicular direction. But looking at all the examples of circular waves that I posted above and that show up as circles, not just in areas where the wave crest was in specific directions, this probably doesn’t make sense. If anyone is reading this, what do you think?? Clearly I need to think about this some more to figure out what’s going on here. I’m grateful for any input anyone might have! 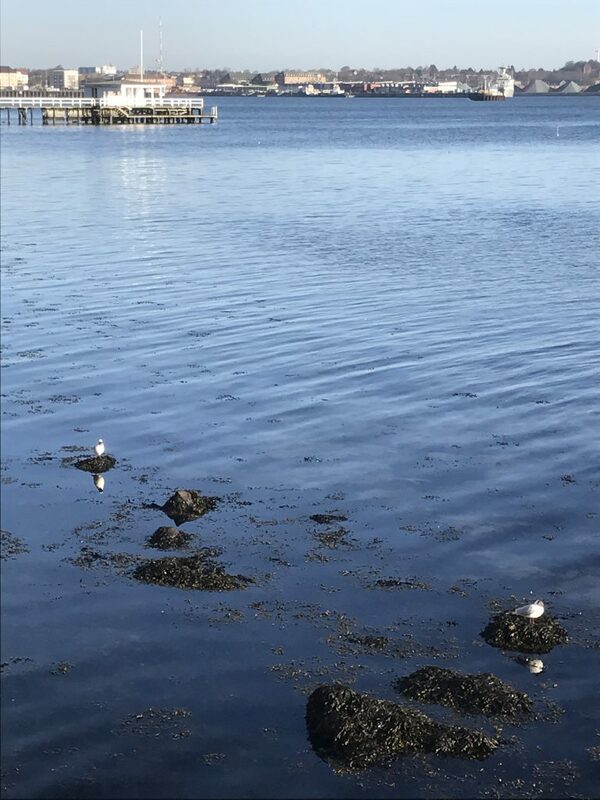 This entry was posted in observation, wave watching and tagged interference, light, optics, reflection, refraction of light, total internal reflection, total reflection, wave watching on March 1, 2019 by mglessmer. 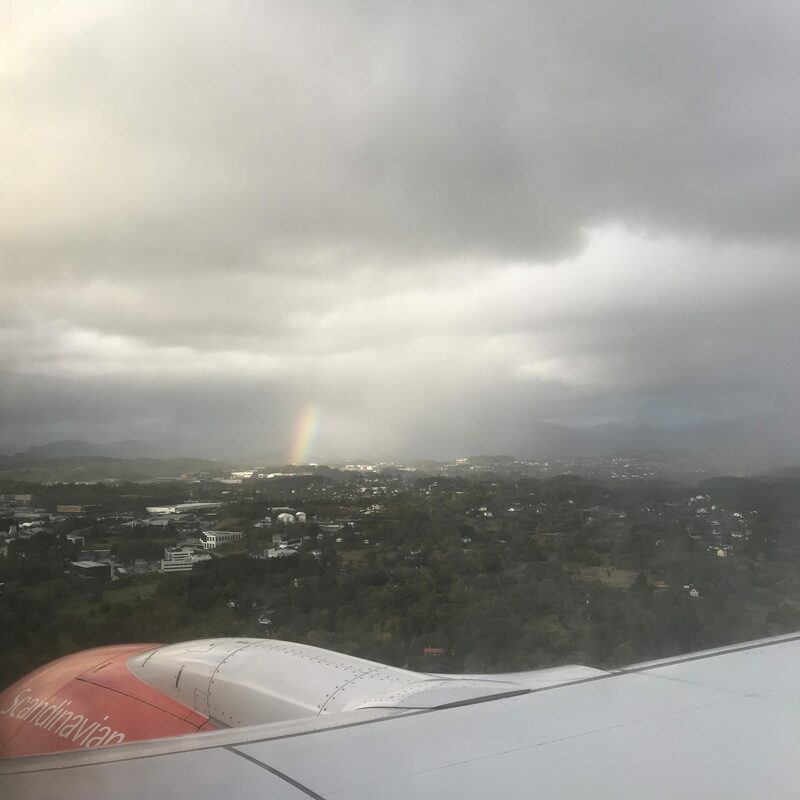 Yesterday when approaching Bergen airport, I saw something super cool: The lower half of a rainbow! Even though I grabbed my phone and snapped a picture in record time, I didn’t manage to capture it. Bummer! But that doesn’t keep me from writing about it while showing you a “normal” rainbow I took a picture of a couple of minutes later. 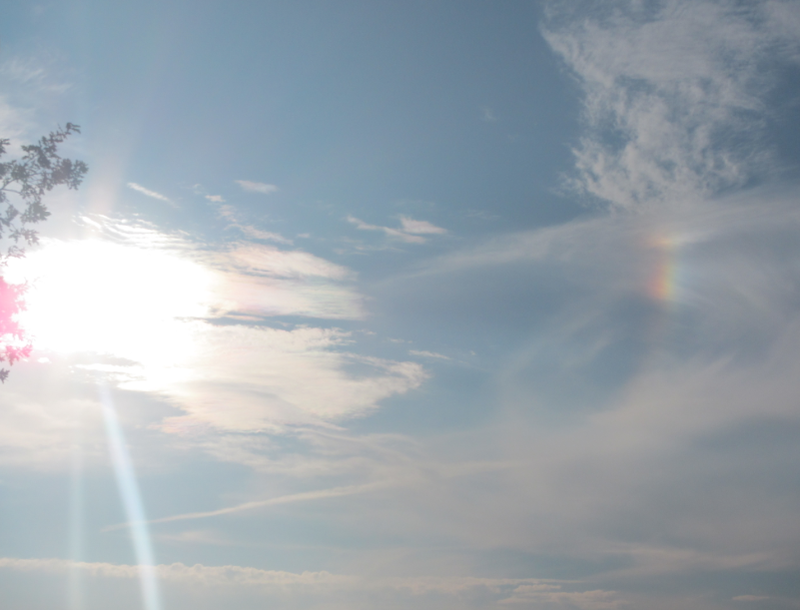 Have you ever seen the lower half of a rainbow? But can you imagine it? 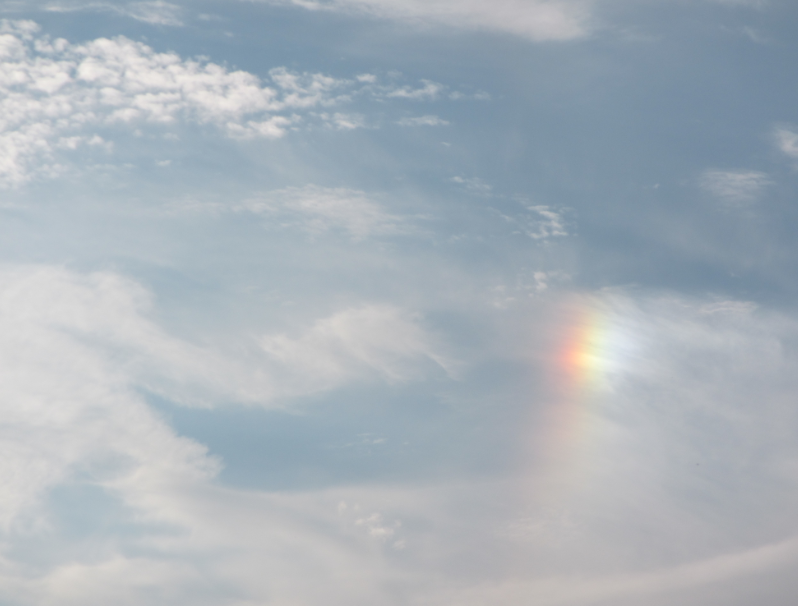 A u-shaped rainbow? 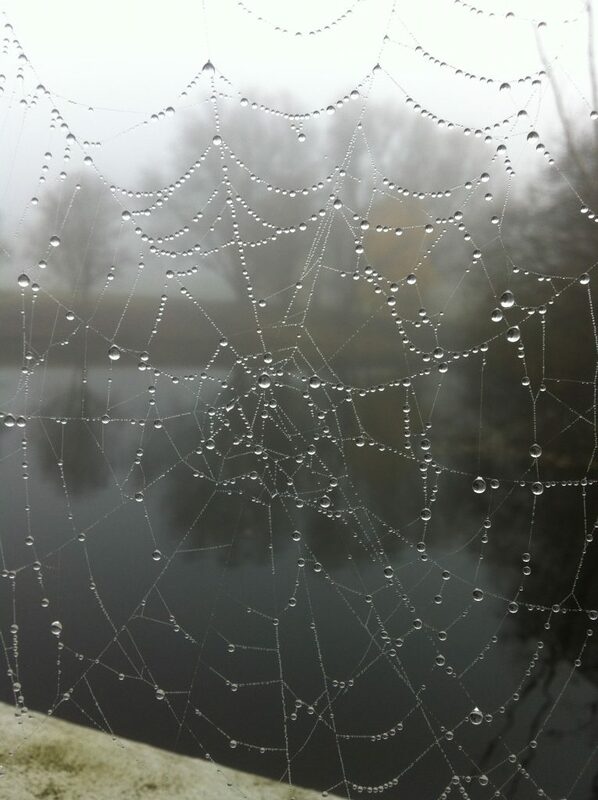 Imagine you are a floating in space, looking at a curtain of rain drops. The sun is shining from behind you onto that curtain. What you then see on that rain curtain is a full rainbow circle, purple towards the middle and red towards the outside. 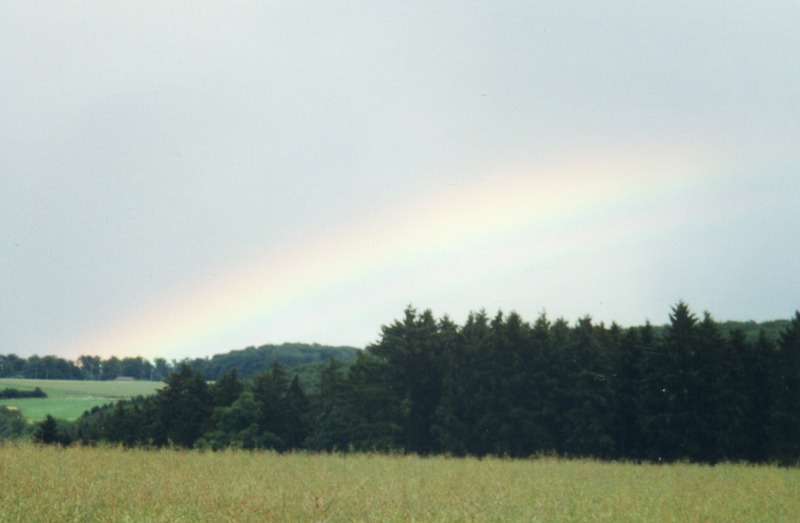 The size of the rainbow depends on how far away from the rain curtain you are. Imagine looking at the shadow that your head is making on the rain curtain. The line from your eyes to the shadow of your head will be our reference. Now imagine looking at any point on the rainbow. 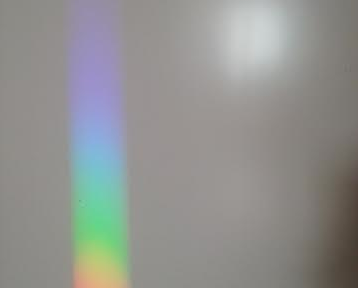 The line from your eyes to any point on the rainbow will be at a 40 to 42 degree angle to the reference line (40 degrees if you are looking at a purple point, 42 if you are looking at a red point, anything in between for the other colors). Now imagine moving the rain curtain farther away. 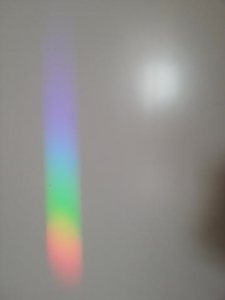 The angle between the reference line and the line to the rainbow stays the same, but the further away the rain curtain, the larger the rainbow. 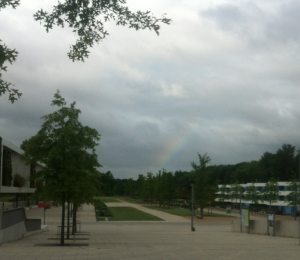 And vice versa: The closer the rain curtain, the smaller the rainbow! So now imagine a nice curtain of droplets that you can walk towards and away from (sprinklers! garden hoses!) — the further you walk away, the larger the rainbow gets. And the closer you come, the more it shrinks again. If you walk close enough to the rain curtain, you can actually see a full rainbow. 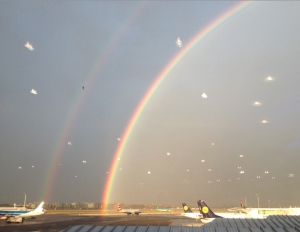 But typically when we think of rainbows, we think of those occurring naturally, and then the rain curtains aren’t as neat and tidy as those from a sprinkler, and rainbows that we see are usually far far away, and thus really big. And that is why we aren’t used to seeing the lower half of a rainbow: Where the lower half would be there isn’t any rain curtain for it to appear on, because there is ground there! And the only way not to have the rainbow hit the ground is either have it close enough in front of us so it’s too small to even reach the ground, or to look at it from a plane that is high enough above the ground that even a large rainbow has enough space above the ground to fully appear on the rain curtain. So where do we go from here? I need to a) play with sprinklers and take pictures of rainbows! b) draw illustrations of the stuff I tried to describe above, and c) hope that I’ll be faster next time to finally get my u-shaped rainbow picture from a plane! 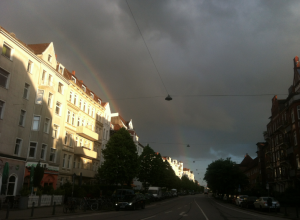 This entry was posted in observation and tagged Bergen, optics, rainbow on October 1, 2018 by mglessmer. 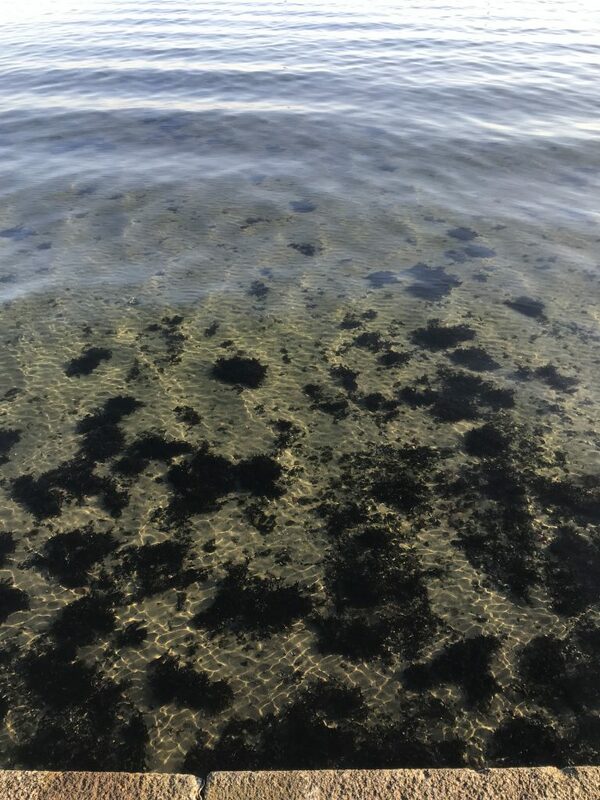 When we speak about “observing waves”, we usually mean looking at the water’s surface as an opaque surface that reflects the sky and where we see waves mainly due to being lit differently on different sides. But there are other ways to observe waves! For example by how they focus light on the ground below. 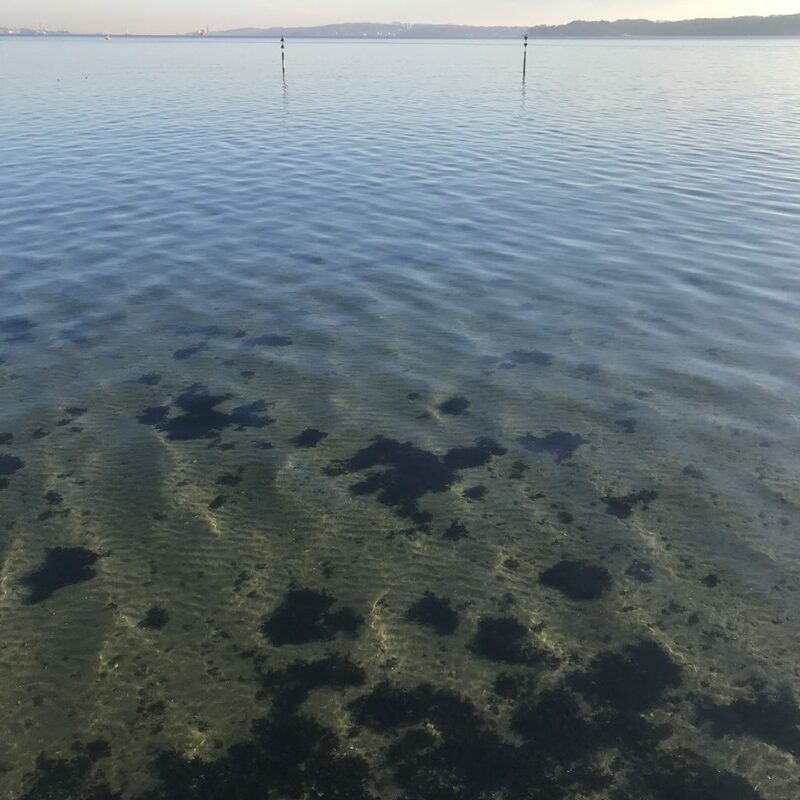 In the picture below you clearly see several groups of waves formed of smaller ripples. 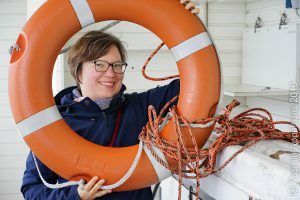 Of course what we see when we look at the lighter and darker spots on the sea floor is not only an image of the waves above, but it is also influenced by the structure of the seafloor itself. 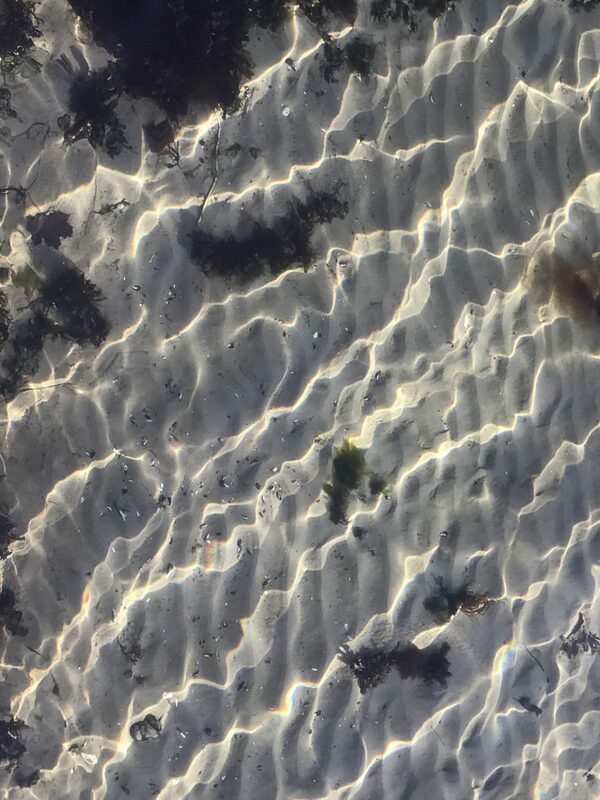 You see that below: The ripples in the sand distort the image of the waves a little. Nevertheless, it isn’t too difficult to see which general shapes are due to the waves and which due to irregularities in the surface below. Sometimes the lighting is such that you can see both into the water in some places and then see the sky reflected in others. The places that reflect the sky are showing waves the way we would usually observe them. In the picture below, we see wind ripples in the background, and in the foreground two main wave fields: one coming towards the viewer with crests parallel to the shore line on which I am standing, and a second field, whose crests are perpendicular to those of the first field. 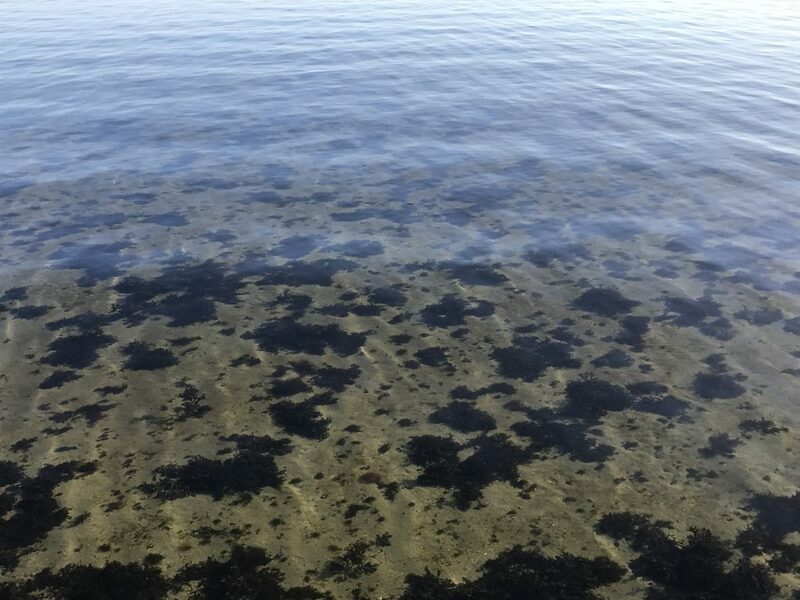 But in the region where we can look into the water, only the second wave field shows up clearly in the lighter and darker regions on the sea floor! Still, those regions give us a lot of information about the wave field that we don’t usually observe. For example all the small structures below don’t show up as clearly when we look at the sky-reflecting regions, do they? 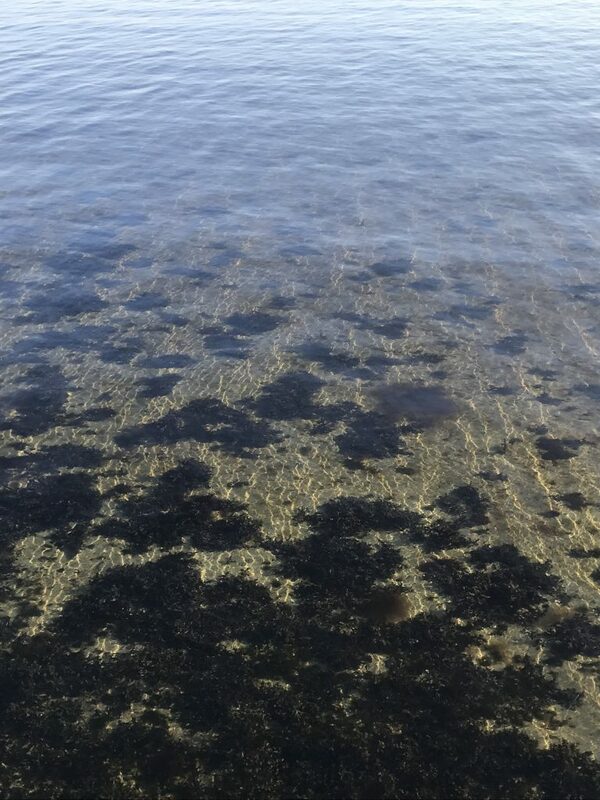 I find it quite fascinating how all those structures that show up on the ground are a lot more difficult to observe when just looking at the sea surface. 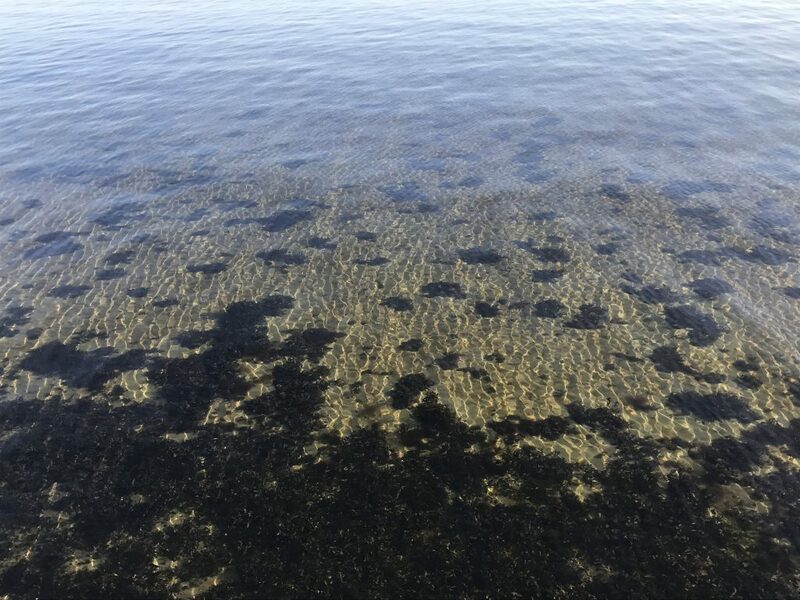 Would you have guessed that there are so many tiny ripples on the surface? And also here, the wave crests perpendicular to the shore I am standing on show up a lot more clearly in the light and dark on the sea floor than on the surface, don’t they? This entry was posted in observation and tagged observations, optics, waves on March 30, 2017 by mglessmer. This entry was posted in observation and tagged light, optics on March 2, 2017 by mglessmer. 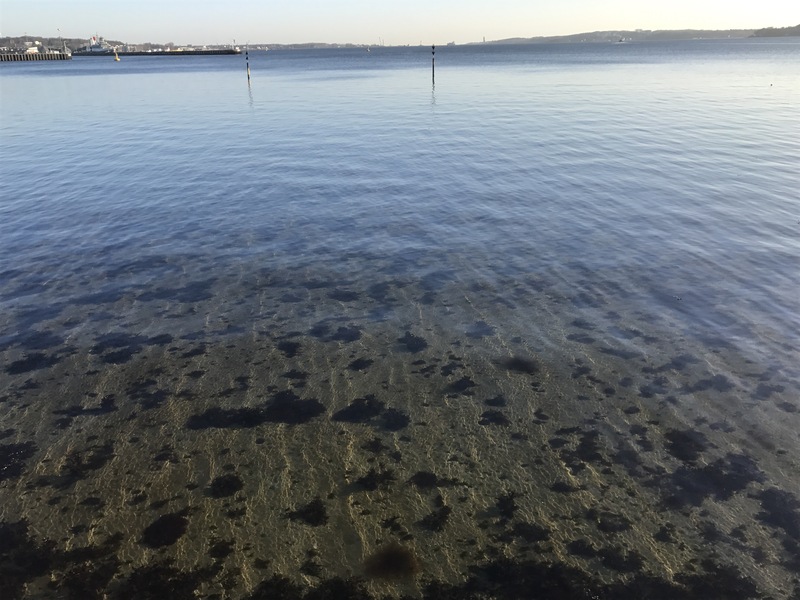 I was waking along Kiel fjord one morning and noticed a stone “jump” on the ground as waves went over it (and actually, that observation was the motivation to dive into stuff from the last post, too). I think the stone only looked so curious because the rest of the ground was uniformly sandy and hence didn’t seem to move. Funny. I think in physics class in school, I would absolutely have hated it had I gotten the task to draw all those different diagrams, and here I really enjoyed it. Maybe because of that jumping stone? Would the right motivation have helped me as a kid to get interested in this? I think it wasn’t that I was not interested in physics, but it would never have occurred to me to sit down on my own to sketch optical paths or anything like that. Now if I could figure out what changed for me, maybe we could use that to make other people interested in physics, too? This entry was posted in observation, Uncategorized and tagged Kiel fjord, light, optics, refraction, water on December 29, 2016 by mglessmer. 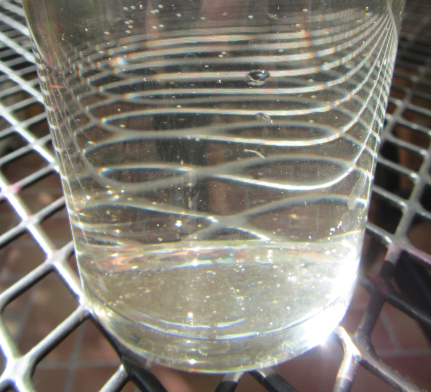 Looking at how light gets refracted when it enters water is always fascinating. There are a dozen blog posts on the topic on this blog alone, but let me talk about it again today. In a 1908 article, Charles Judd (as summarised in Barnett & Ceci, 2002) describes an experiment where kids throw darts at a target submerged under water. Half of the kids, in addition to practicing throwing darts, are taught about refraction of light in water. While all kids do equally well on the practice task, the kids that understand the physics do a lot better when the water depth was changed. Why? 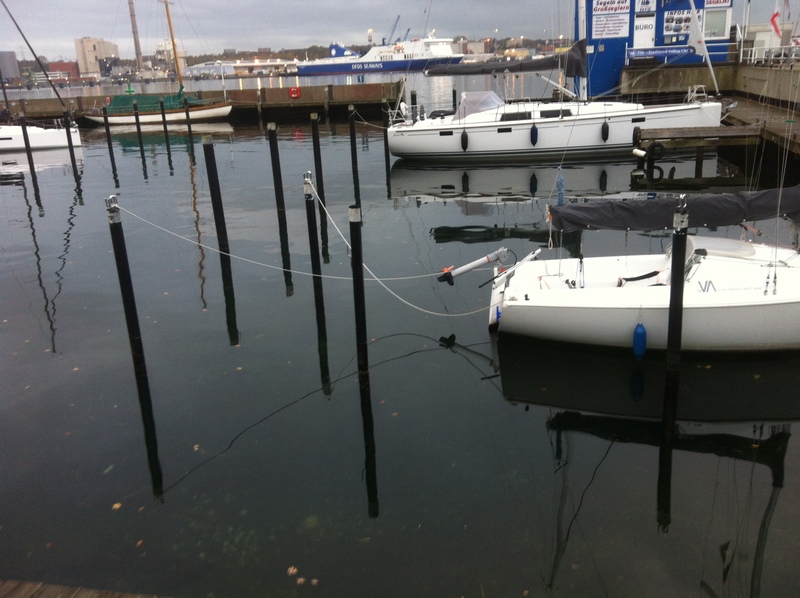 When the water depth changes, the target appears to be located in a different position than before. 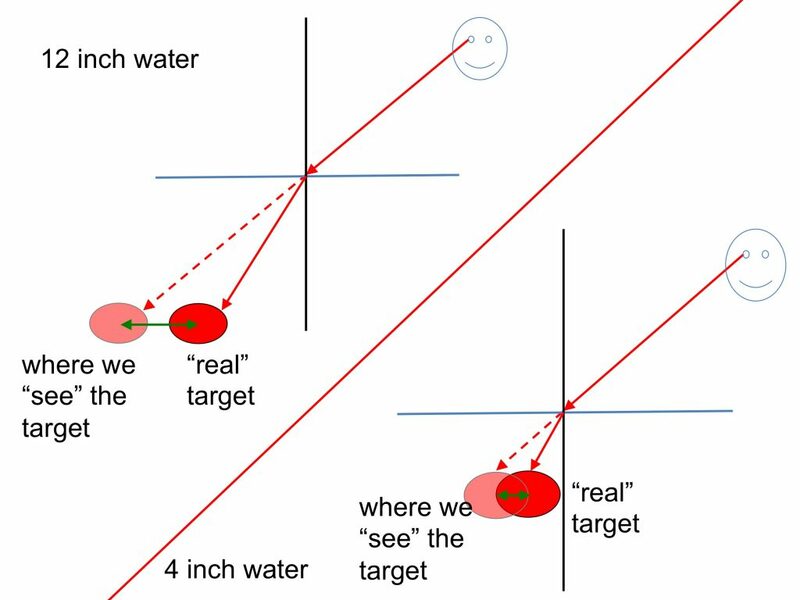 With shallower water, the target we see is a lot closer to the real location of the target. So kids that did not understand why they had to aim at a position off the target they saw to actually hit the target had a much harder time adjusting the way they aimed than those kids who actually understood what had changed. 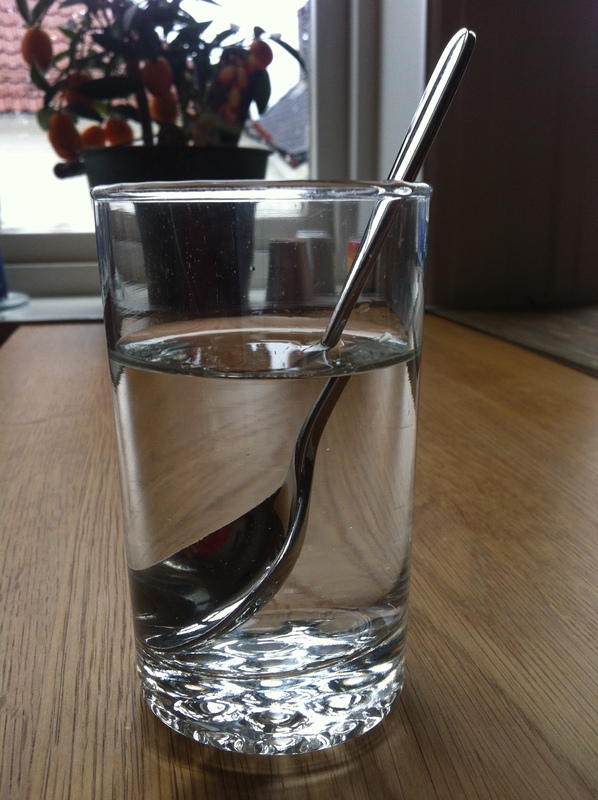 But refraction is always cool to look at, even without throwing stuff. Here a picture from one of my very first blog posts (still in my house in Norway). 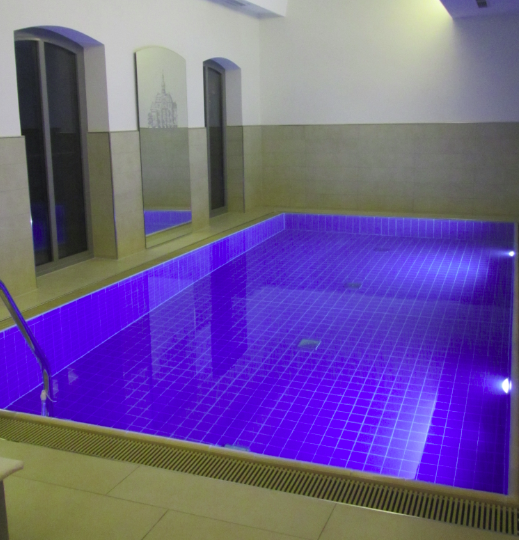 Or a swimming pool in Lüneburg that appears a lot shallower than it actually is (from this blog post). Or a table that gets completely deformed when seen through a glass of water (from this post). Refraction of light in water. This entry was posted in observation and tagged light, optics, refraction, water on December 27, 2016 by mglessmer.